Stop right there! As in any of these fun restos from the 450 and beyond, suggested by 10 bloggers I know, whose DNA hits 100 on the foodie scale (you’ll find the addresses suggested by the first 5 bloggers right here). 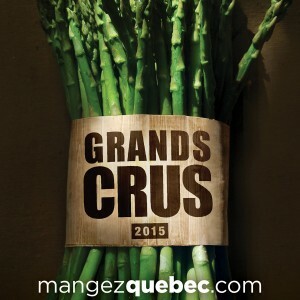 You also know some seriously good restaurants in the suburbs around Montreal? Send me your suggestions and I’ll happily share them in this blog and on social media. With some generous crowd-sourcing, we could build a GoogleMap from hell, isn’t that a great idea? By the way, for my own personal recommandation during the shortlived seafood season, scroll to the end of the post. Yep, a +1 in the good ol’ tradition of dining out. Happy roads to all! — Antoine Gélinas was born in a family where food is generally written with an uppercase F. A past restaurant owner, he has followed his food obsession the world over, from Montreal to New York and San Francisco to Cairo. The kind of guy who cooks a large hog mechoui-style in his backyard, he may arguably be the busiest blogger in town. I confess readily, I’m a snob. The mere idea of leaving the 514 always sends shivers down my spine. Why venture to the 450 when I can find anything to please on my beloved island? Still, professional pursuits draw me away from civilization to forage in the suburban jungle. One of the best reasons to venture far and wide is to visit Chez Lionel, the friendly bistro of chef Ian Perreault, for a gratifying brunch. The space is generous and airy, natural light abounds, you feel instantly comfortable. Whether I choose the breakfast poutine, salmon tartare, eggs benedict or the toasted olive-oil banana bread on 78% dark chocolate cream (shown above), I’m a happy man. The welcome is impeccable and the servings generous. The 450 has a reason to be proud! — Foodie Date Night brings together Aaron and Carolynne, a married couple of culinary school graduates, former restaurant industry employees, and all around food enthusiasts. 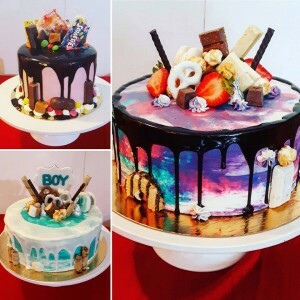 While eating and cooking are their passion and hobby, it’s no longer their livelihood beyond the personal blog where they review restaurants from time to time. 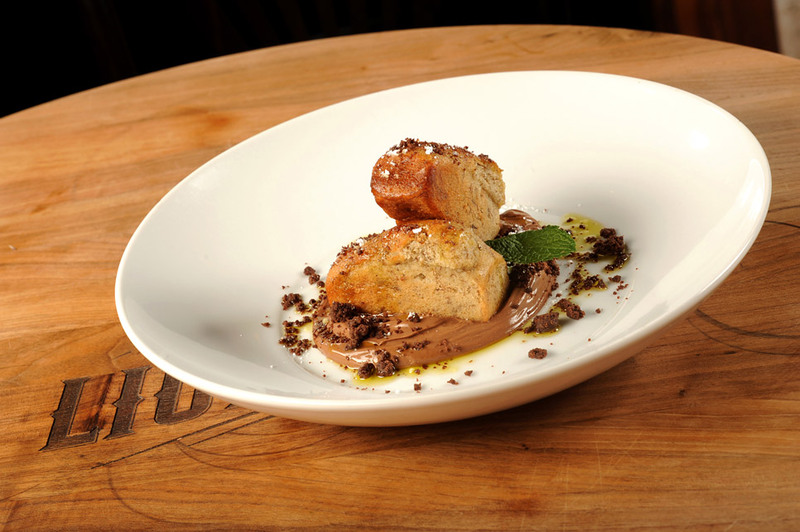 We’ve often found that the best food can be found in the most unlikely of places; Aryana is precisely one of those places. 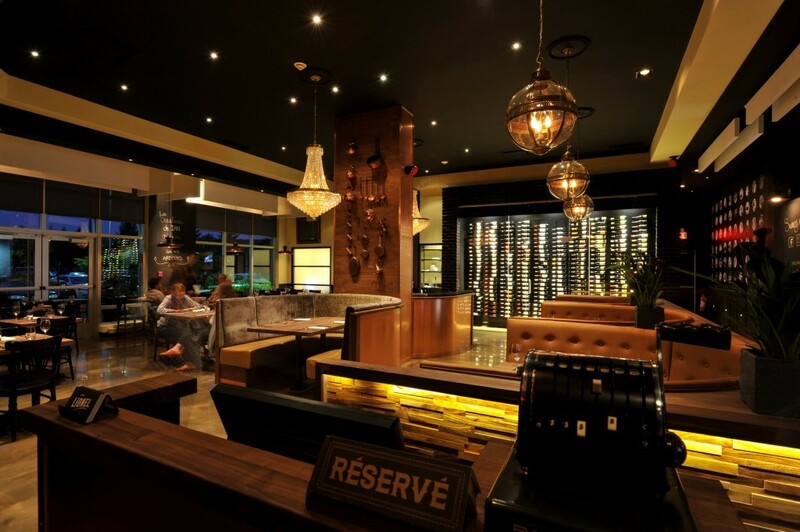 Located in a mundane strip-mall in Dollard-des-Ormeaux, this Afghani restaurant is owned and operated by a charming family with a deft hand for comforting cookery and genuine hospitality. Start with the Badunjan Burani, supple slices of eggplant seasoned with a kiss of garlic, garnished with a swirl of tangy yogurt and grassy dill. Follow with the house specialties, a side order of their sensational Kadu, savory stewed cubes of pumpkin and the Kabuli Palow, a generous portion of fragrant rice topped with tender pieces of braised lamb, shaved carrots and sweet raisins. Don’t forget to BYOW. The summum of junk food beyond the South Shore? — Janice is a PhD-chemist-turned-baker with a serious sweet tooth. She blogs about baking and works as a recipe developer and food stylist in Montreal. You can find some of her work on magazine covers locally and even abroad. Inevitably, after a day of skiing in Bromont or spa-ing at the Balnea spa, all I can think about is scarfing down a great poutine. Cue Fromagerie Qualité Summum. Order the classic poutine made with deliciously golden fries that are perfectly crispy on the outside, a killer gravy, and of course, squeaky cheese curds. 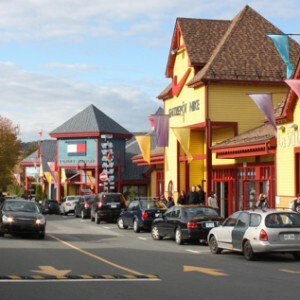 It’s perfect and reason enough to take a joy-ride out of Montreal and visit Bromont (if the spa and the skiing aren’t enough to convince you). — When introducing herself, Julie often says she’s an octopus-mom or a slash-her (mother/blogger/teacher/handywoman/freelancer) who likes to put words on woes, see the positive side of negative turns, and who strongly believes that social media can make a difference in people’s lives, offer a ray of hope when everything’s going wrong. Noire et Blanche is a beer pub in the Lower Laurentians, located in Old Saint-Eustache on the banks of rivière du Chêne, where I like to stop for a beer (or hard cider) bock, have a snack, enjoy the terrace, etc. I appreciate that they promote local and artisan products, the pleasant atmosphere of the historical surroundings, all without travelling far (to Montreal, for example!). Everything on the menu is good and the staff can suggest the best beer pairings, which I love since I’m no connoisseur! — Valérie Thibault is a writer and blogger with a passion for travel and fine dining, shared in no less than two blogs featuring her discoveries. A mother with a foodie toddler, she dares to take him on her wanderings. 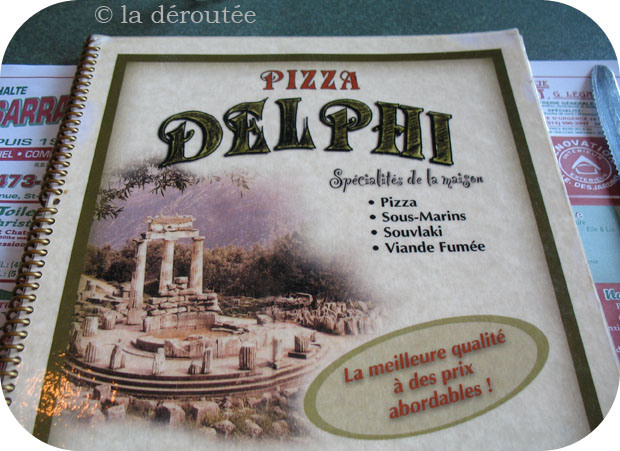 When I was in high school, I would take pleasure in arguing with friends who claimed pizza was Italian : “No, no, you’re so wrong : pizza is Greek!” I was ready to defend my theory body and soul, by sending them to dine at Pizzeria Delphi, in St-Augustin de Mirabel. 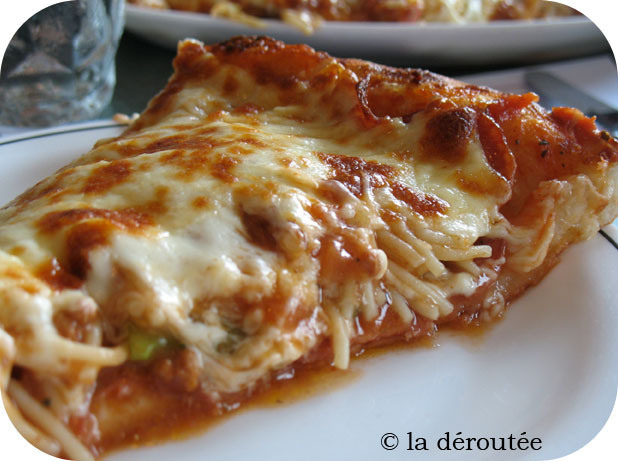 The Delphi Special, an all-dressed pizza with spaghetti and meat sauce in between, marked my childhood; and my family could never order from anybody else but our Greek friends. 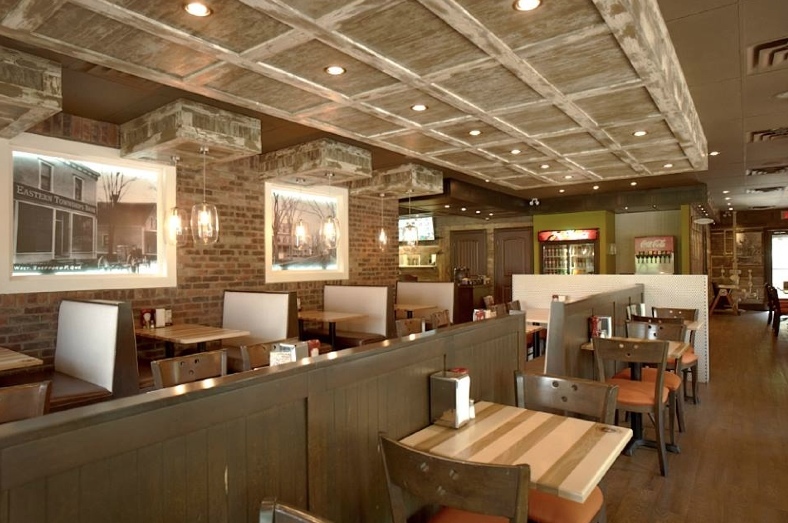 Over the years, the small delivery counter has expanded into the neighbourhood’s family favourite restaurant. 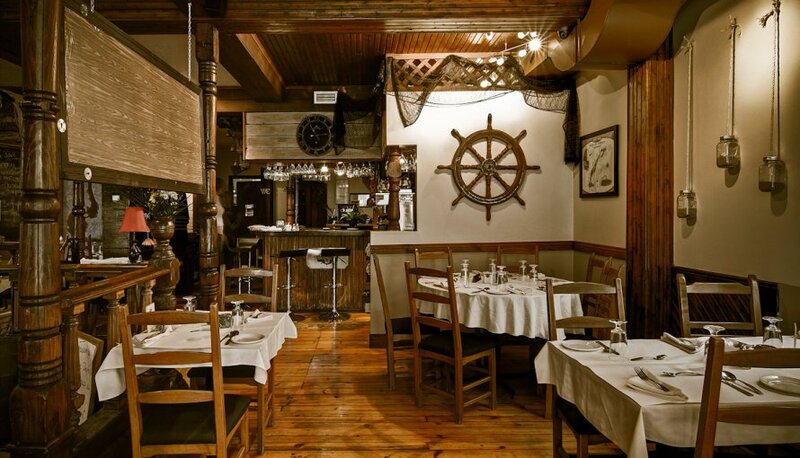 The walls are still covered with countless old-time photographs, the service is as welcoming and heartfelt; above all, the pizzas, submarines, Greek specialties and smoked meat sandwiches have the same appetite appeal. A must-stop over on Montreal’s North Shore and a 30 minutes drive only. I have many favourite suburban haunts since I live in Laval. 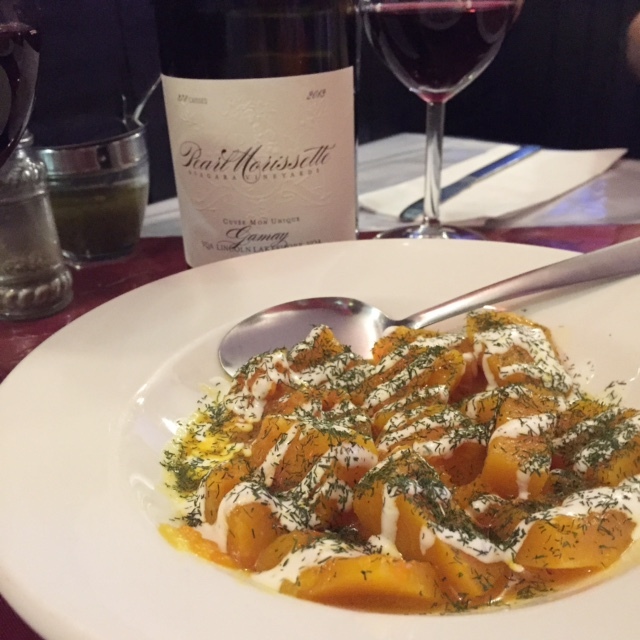 Rather than introducing you to my family’s everyday go-to restaurant, I thought I would present my latest discovery, Capitaine Doyle in Old Saint-Eustache (yes, the same neck of the woods as Julie above). Imagine an old house transformed into a restaurant where Magdalen’s Island specialties are served with authentic island accent. Their specialty? Seafood, what else, especially lobster which is in season right now—and which explains my choice. 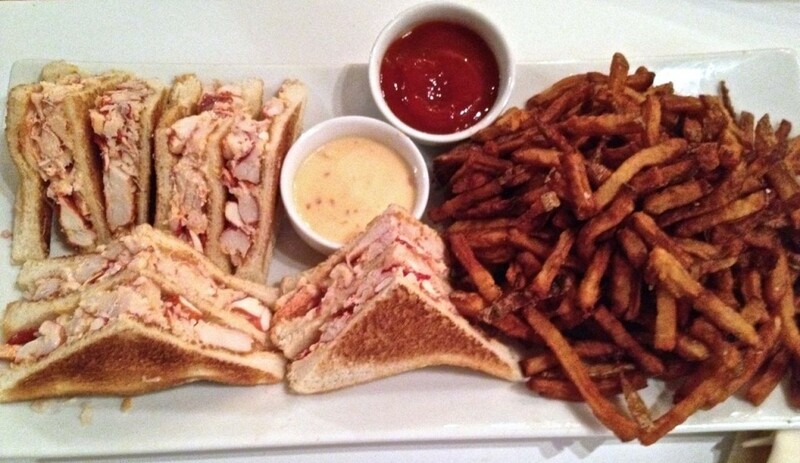 Lobster club, lobster roll, seafood platter, lobster poutine even : in other words, everything for the seafood lover in you. Last March, in the middle of a snow storm, I even ate a lobster rice served with fruit salad right smack in the middle. A little bewildering yet surprisingly chaming (but, let’s face, Monsieur would suggest you go for the classics and just club ‘n’ roll if you go). Bon appétit.